Red deer is the royal game of Europe, and is found in most European countries. Carefully preserved by kings and princes, red deer survived the agricultural and industrial revolutions, and thrives over Europe. Portugal and Spain, Poland and Belarus, Germany and the Czech Republic, Romania and Bulgaria - it would be hard to name a European country that doesn’t have any red deer hunting. Further east, in the mountains of Kazakhstan and the Asian parts of Russia you find the maral stag, which is also a variety of the red deer (unlike the izubr, which is a variety of wapiti). Europeans introduced red deer to other continents as well, and red deer hunting opportunities in Argentina, Uruguay, Australia and New Zealand don’t leave anything to the Old World. The most affordable red deer hunting opportunities are to be found in Eastern Europe. In countries like Belarus and Poland you can hunt a red deer for $600-$1000. But mind the trophy fees - those aren’t usually included in the listed price of the hunt, and may vary greatly with antler size from $300-$500 for an indifferent trophy to $3,000-$5,000 for a medal class crown, and up to $10,000 for a record book entry. Most red deer hunting adventures in Argentina and New Zealand are priced between $5,000 and $10,000, and may come as a flat trophy fee or as a combination with other species. Cow and cull/management hunts are an affordable way to be introduced to red deer hunting. Centuries of red deer hunting in Europe developed a set of unique hunting traditions. One of them is the Monteria, a big driven hunt peculiar to the Iberian peninsula. Evolved from village hunt to a royal chase, run according to ancient tradition and ritual, fabulously rich in harvest opportunities - what is it about, and how do you behave should you decide to participate in one? June 7, 2018 Monteria: Hunting like a king! When to hunt Red Deer? In Europe, red deer hunting season typically starts in August or September, and runs until November or December. The best season to hunt the royal stag is, of course, the rut, when the forests are shaken with his mighty roar. In the Southern Hemisphere the seasons are shifted proportionally, and the rut usually occurs in March, and the season running into August. Spot-and-stalk hunting was perfected by the British aristocracy on the open hills of Scotland, and is widely practiced for hunting red deer where they inhabit the more or less open terrain. 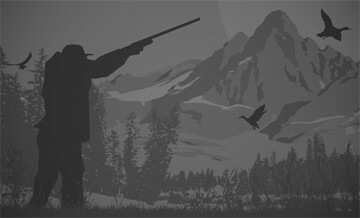 The hunter is usually accompanied by a guide that will direct the stalk and estimate the size of the stag. Red deer are also taken during the traditionally European driven hunts. But by far the best red deer hunt is by calling a stag in during the rut. Red deer has been the most prized big-game animal in Europe for thousands of years. Pendants made of red deer canines were a prestigious decoration during the Neolith, and in some medieval kingdoms you could be fined for killing a man and hanged for poaching a deer. Was it because of the exceptional taste and nutritional value of the venison? Or the grace and power of the monarch of the woods? Join the red deer hunting tradition; stalk the hills of the pampas, or face the challenge of the royal stag in a traditional European fashion, and find out for yourself. We pride ourselves on offering the very best free range tahr hunting on foot, as well as the opportunity to hunt red stag, fallow buck, bull elk, chamois, wild boar, feral goats and Arapawa rams. We own more private land in the prime hunting areas than any other hunting Outfitter in New Zealand, we have two modern and up-market Lodges in separate locations with a very experienced team to make your dream hunt become a reality.